Enjoy an introduction to the city of Bangkok with this short city break or stop-over, which can be run on any date throughout the year and adjusted to fit your requirements. Visit some of Thailand's most famous and important historical sites and temples, and balance these with longtail boat trips and colourful floating markets. Discounts on the tour price are available for parties or families of 4 or more. Note: this tour follows the same itinerary as our Classic Bangkok Break, which stays in 5-star hotels instead of 3 to 4-star hotels used here. We will meet you on your arrival into Bangkok airport if required, and also include a departure airport transfer. An optional introductory walking & public transport tour is available on your first afternoon to give you an initial taste and feel of this busy city. Our first sightseeing tour takes us to Wat Phra Kaeo, the holiest Buddhist site in Thailand, and home of its holiest image, the Emerald Buddha. This ornately decorated and gilded temple sits in one corner of the huge Grand Palace complex, which is full of different structures, statues and buildings. The whole site is surrounded by an arcade with 178 different painted panels depicting the story of the Ramayana. After a lunch in a restaurant by the river, we board a longtail boat for a private cruise around the Klongs (small canals) of Thonburi, the site originally chosen for Thailand's new capital after the fall of Ayuthaya. Our trip takes you through leafy residential areas which feel a world away from the chaotic streets of modern Bangkok, across the river. We visit the Royal Barge Museum, but also head off the normal tourist route to visit an orchid and spice farm and gain some karma by feeding the fish at a local temple. We finish the day's tour with a visit to the temple of Wat Po, which features a huge reclining gilded Buddha. A dinner cruise on the Cho Phraya river through the centre of Bangkok on either a traditional rice barge or a modern luxury vessel, makes for a relaxing end to the evening. Our next day has an early start as we head a little out of Bangkok to Ban Paew for a boat cruise along the Canal. 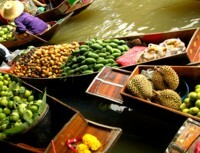 After enjoying the sights and day-to-day life of the Thai people who live by the canals, the cruise ends at the most colourful floating market in Thailand, at Damnoen Saduak, where a multitude of boats bustle around selling everything you can imagine. We offer several different options this afternoon to either extend the tour from Damnoen Saduak to visit a village cultural show, or a handicrafts village, or to return to Bangkok for an afternoon learning about and enjoying Thai cooking, or visiting more temples. Further options are available to extend the tour to do day trips to Ayutthaya or the Bridge on the River Kwai at Kanchanaburi, or to head to the beach. You can also combine this tour with a couple of days on the unique Thanathree Rice Barge.